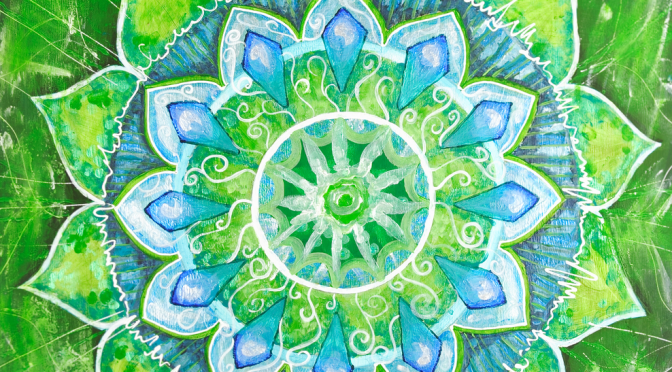 The heart chakra is also known as Anahata, and is the chakra that focuses on our emotions and sense of spiritual self. Anahata is translated in Sanskrit as ‘unhurt, unstruck and unbeaten’. This is meant to relate and bring attention to the difference between your higher emotions and lower emotions. We get hurt and offended by many things in our day to day experiences but nothing can really ever challenge our higher emotions. Our self love, respect, happiness and respectful sorrow are housed in the category of higher emotions. The seed and twelve petaled flower are the symbols of Anahata. This association to encourage the attitude of growth and beauty when examining this focal point. Of course you can attend to any of your chakras at any time but I strongly recommend that when you feel a disturbance in your chest you set time aside to focus on it. The heart is vital to being able to bring out the most awesome and productive versions of you. The practice below can help you get out of that rut you’ve been perceiving or help you get back on your feet after a bad experience. On the flip side balance is a must. Your heart chakra can be pushing out more energy than it needs and this causes you to lose control of your empathetic responses. Methodology of chakras was purposed as a way to maximize your energies by way of visualization. Sitting in a quiet and safe place start bringing your attention to your breath. Start to come into awareness of how long and deep each draw is. Bring your attention to your sternum, feel the rise and fall. Smile to yourself and thank yourself for taking the time to love yourself. As you come into a meditative state set your intention. Your intention here will be a two part statement. One aspect of it will be addressing your immediate crisis or need. For example, recognizing the end of an relationship or ending a cycle of self perception that is harming you. The second part will be a longer term intention, one meant to help enforce and keep your sense of love and appreciation. As you visualize your heart energy, pay attention as equally as you can to both the positive and negative elements effecting it. Seek out the sources of hurt, who caused them? How did you feel, specifically? As you find the factors that are causing you discomfort forgive the person or concept that trespassed on your sensibilities. Then forgive your self. You are human and have every right to feel the way you do. Besides now you are taking the time to better yourself and your reactions. What else could you want from yourself? After you have acknowledged and forgiven the last step is to let go. Don’t push the formation away but stop paying it more attention than needed. Finishing the relationship on your terms only works if you stop feeding more energy into it. This is reiterating the letting go aspect. It’s easy to remember an upsetting situation and getting twisted up over it all over again. Stop the cycle now! Make the last interaction between you and these formations a positive one. Then remind yourself that you are above this conflict now. Breathe and turn away from it. Don’t fill your time with running from or pushing it away. Let it hang out in the living room of your heart throwing it scraps of love. It will eventually dissipate. As part of your higher emotions your self worth is something nothing can ever affect. No matter what anyone says, how any one treats you, or mistakes that you’ve made, NOTHING changes how important and beautiful you are. At times, with enough negativity clogging your heart chakra it may seem like our self worth is in decline. This is just our perceptions. Take the time to remember that no matter how bad things seem now you are an infinite being. This means you have infinite mess ups and infinite ways to grow as a result. That fact that you recognize your need for self love and are taking the time to address it productively should help bolster the concept of your potential. So you’ve if identified, acknowledged, loved, forgiven, cried at, (hopefully) giggled a little at the independent elements that are affecting your heart space. The tinkering and tuning stage are over time to hook your chakra back up to chest. Turn your attention from the nitty gritty to the sum that is you. Think back over the different resonance levels you experienced. What do your vibrations look like now? Make connections to the ideas, people and mindsets that varied your vibrations.